Canberra's transport network has solid foundations with an extensive network of roads, imminent light rail network and increasing and continuing investment in bus and active travel networks. The diversification of our transport network is acting as a catalyst for change, offering more transport choices for a growing population. As Canberra grows and jobs centralise, commutes are increasing. The average distance between where Canberrans live and work has lengthened, despite significant new housing in town centres and along transport corridors. Transport will make up more than 60% of the ACT's greenhouse gas emissions when the ACT reaches its 100% renewable electricity by 2020 target. To reduce our dependency on car travel, it will be critical to integrate where people live with our public transport investment to support affordable and accessible transport options. 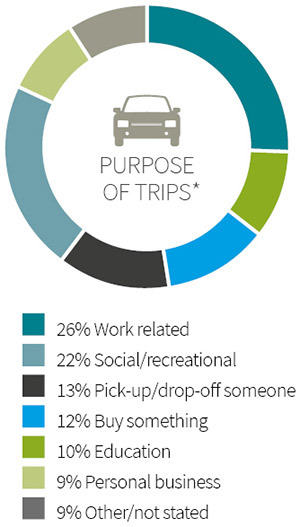 Household travel costs are linked to housing affordability. Improving public transport options and enabling more people to live close to jobs, services and rapid public transport are ways we can reduce car dependence and pressure on household budgets. Canberra has become a globally-connected city following the introduction of daily international flights from Canberra Airport. This direct global reach has the potential to significantly stimulate the economies of the Canberra region, providing opportunities for current and prospective exporters in the city and region, and enhancing tourism opportunities. The airport, rail infrastructure from Canberra to Sydney and the national highways into and out of the ACT provide a good basis for the distribution of freight and are important considerations in shaping the city for a successful and globally-connected economy.